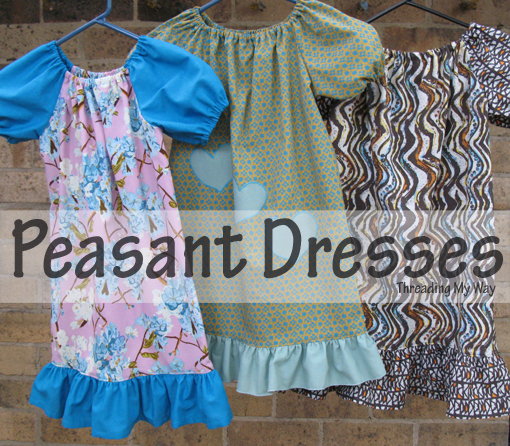 Making these peasant dresses was my first time using a pattern from Create Kids Couture. I've used the Marilyn's Slim Fit Peasant Dress, available as a free download from Fabric.com. 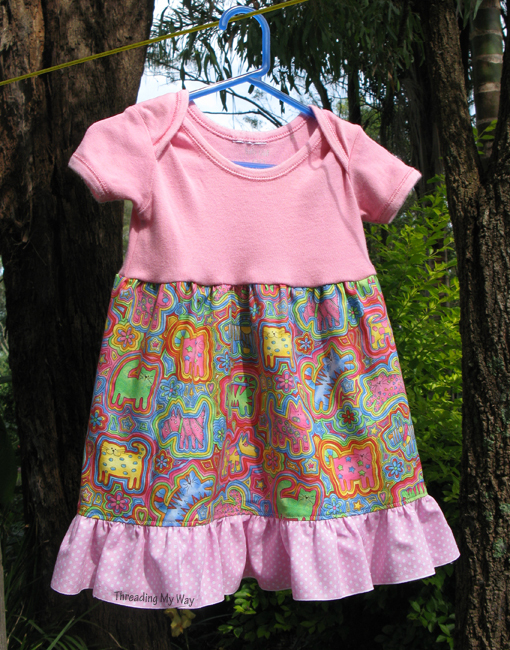 This little dress is SO quick and easy to sew!!! 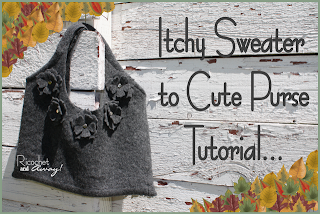 The pattern gives clear, detailed, step by step instructions, with lots of photos included. If you are new to sewing, this would be a good pattern. The hardest part of the dress is the ruffle. If you found the ruffle too difficult, the dress could be lengthened and finished with a hem, instead. These little dresses will be joining the previous dresses for the Hopeful Threads sew-along to support Dress A Girl Around the World. Mary, from Ms. Redo, and her daughter, have sewn some beautiful, little pillowcase dresses in support of Dress A Girl Around the World. Head on over and have a look, here and here. Welcome to the eighteenth edition of Threading YOUR Way with Threading My Way. Each ongoing, themed link party is steadily growing into a resource full of ideas and inspiration. 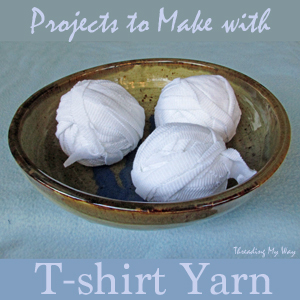 Remember, these linkys are ongoing, so you can continue to add projects throughout the year. Add as many projects as you would like. 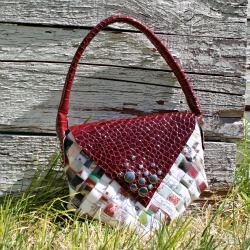 Our eighteenth linky for 2012 is everything Quilting and Patchwork. Making my first quilt is on my To Do list for this year, so I'm on the lookout for ideas to inspire and help me. 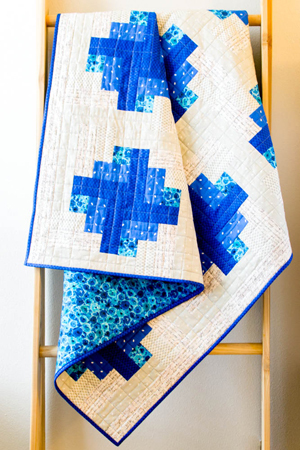 Your projects may be full sized quilts, but you can also link up smaller projects. As long as YOU have made it, link it up and show it off. Link up as many posts on Quilting and Patchwork, as you would like. Come back through the year and add more. Each post needs to be about quilting or patchwork. Link to a specific post (not the home page of your blog). No direct links to shops or giveaways. By linking up, you are giving me permission to use one of your photos in a feature. I will, of course, link back to your post, giving you full credit. By linking up, you are giving me permission to pin your post to Pinterest. I pin all features to Pinterest, unless you specifically request me not to. Subscribe to Threading My Way (GFC, RSS, Linky Followers, email), to keep up to date, to see if you've been featured and to know when the next themed party starts. Grab a button to spread the word about Threading YOUR Way with Threading My Way and put it somewhere on your blog. Visit some of the other links. Everyone loves comments. I usually post Features each Saturday on Threading My Way. I have found the sewing and crafting blog community, to be a very warm and welcoming one; a community of people who help each other and readily share their ideas. From these ideas we all benefit by expanding our knowledge. 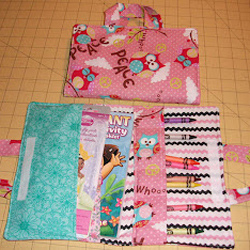 Which way to face the teeth on zips when sewing pouches. Thanks Sew Delicious. Thank you to everyone who linked up to our Sewing Tips and Techniques Party. I so appreciate your willingness to share your knowledge with others. Don't forget, this is an ONGOING linky which will remain open all year. You can continue to add your tips at any time. Another thing that I would personally like to see, is posts on sewing room organisation!!! 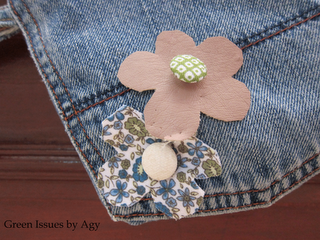 Each week, I will place a blog button, belonging to the blog which was most viewed, in my sidebar. This week, the most viewed link was Sewing Swimsuits. Cindy, look out for your blog button in my sidebar. 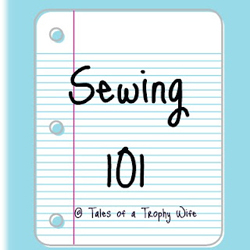 While we're talking about sewing tips and techniques, have you seen the Sewing 101 series, over at Tales of a Trophy Wife? Tara has 7 tutorials, most of which can be completed in under an hour. 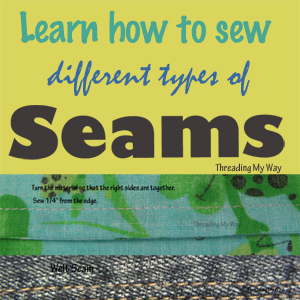 The series is designed for those who are relatively new to sewing, with each week building on the previous week's lessons. This is a great series for building both confidence and skills. A new party for Quilting and Patchwork begins tomorrow. 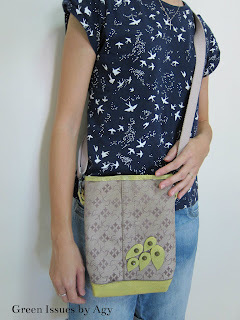 I was lucky enough to win a giveaway, over at Creating My Way to Success... four PDF patterns from Whimsy Couture!!! 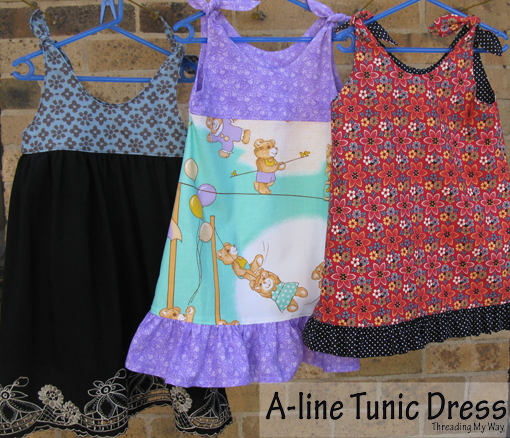 I chose Terrific Tees, Ladies Peasant Top, Hooded Jacket and the one I've made up, the A-line Tunic Dress. Two versions of the A-line dress are included in the pattern: one that is fully lined and the second with a ruffle. You know how much I love ruffles, so of course I chose the unlined one with a girlie ruffle. Sew bodice linings together at side seams. Sew bodice lining to the dress. Sew ruffle pieces to form one long tube and gather. 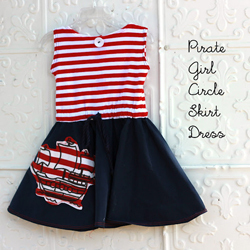 Either way, it's a cute, little dress that's very quick and easy to make. Here's my second version. Isn't that bear fabric just adorable!!! My Mum found this brand new fabric in an Op shop (Thrift Store). This dress is constructed the same way as the first, but with two modifications. These changes are not in the pattern, but are so easy to do. First up, I've added a contrasting fabric for the bodice. Just remember to add the seam allowance to both the bodice and the main fabric. The ruffle, both in the pattern and on the polka dots in the first dress, is a strip of fabric that is doubled over before it is gathered. For my second dress, I haven't doubled the fabric. I like both methods. They just give a different effect. Here's what I began with for my third A-line Tunic dress; an adult's dress. I cut the top of the dress off and have kept the two bands of elastic. I'll most probably use those instead of wide elastic for a couple of circle skirts next Summer. The embroidered hem is the main feature of the adult's dress and I obviously wanted to retain this for the girl's dress. Same as for my second dress, I've added a contrasting bodice. To attach the skirt to the bodice was simply a matter of gathering the fabric and sewing. The bodice lining hides the gathering seam on the inside. When I held the finished dress up, it seemed a little thin. It wasn't see through, but I could see my hand when the dress was held up to the light. Just to make sure, I added a black lining to the skirt. For someone who is new to sewing, this is a great pattern. 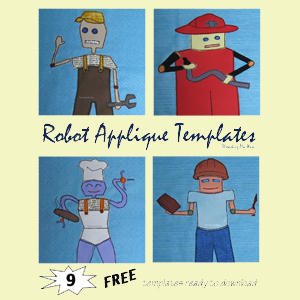 The instructions include lots of photos with detailed, step by step instructions. 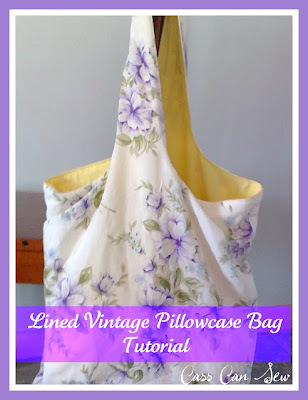 If you are more experienced with sewing, you may not need the instructions, but can use the pattern as a base to create your own design variations. I mentioned that the pattern comes with a fully lined version, which is reversible. That's one for me to make next time. I think I'll need the instructions for that one. Thanks Creating My Way to Success and Whimsy Couture for my new pattern. I love it!!! 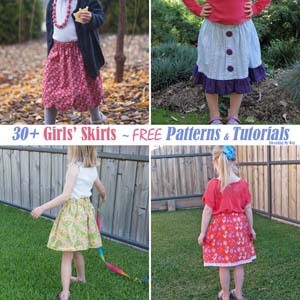 Dress making guidelines from Dress A Girl Around the World. 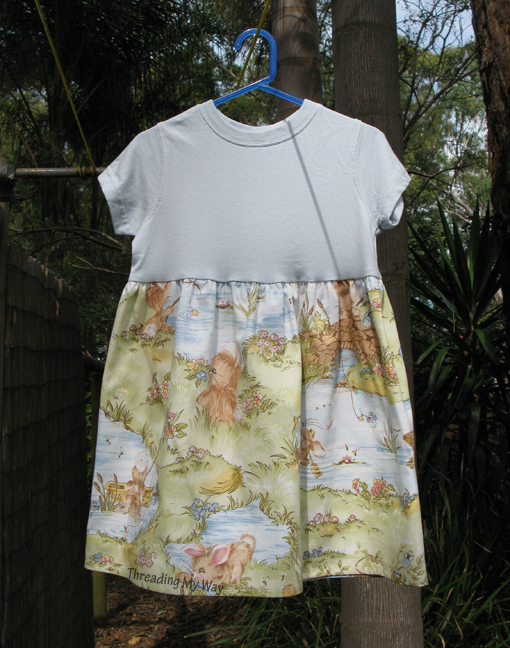 Have a look at some of the gorgeous dresses that have been made for this month's sew-along. 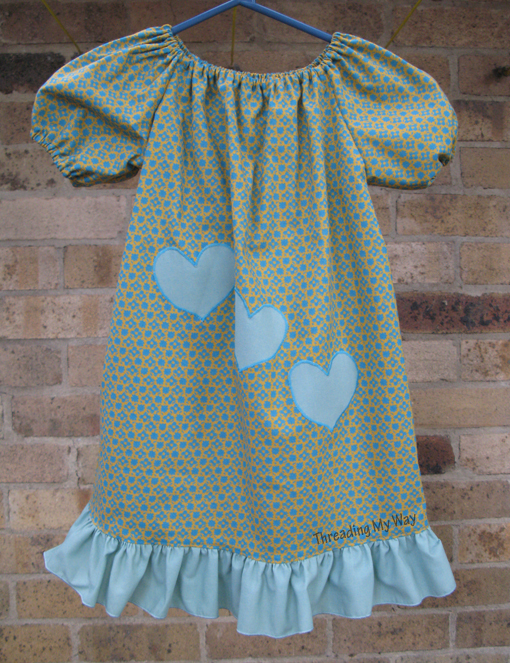 Amy from A Home, Made has made another adorable t-shirt dress and a lovely pillowcase dress. 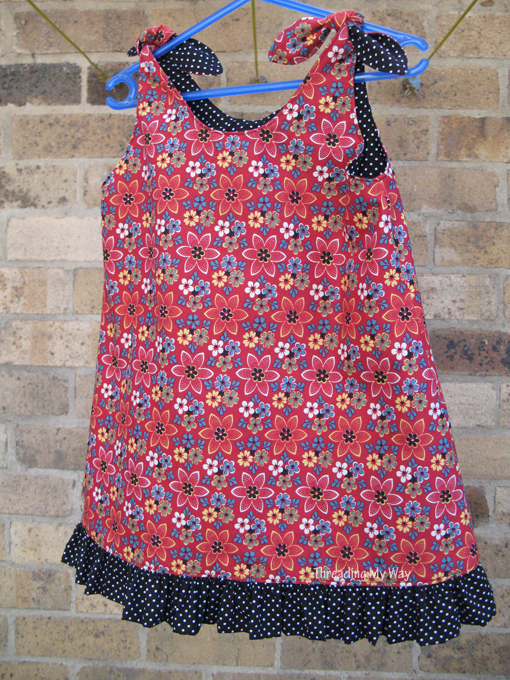 Christie from Joyfoolery had made the awesome Lucy's little flower dress, as well as an ever so pretty pillowcase dress. 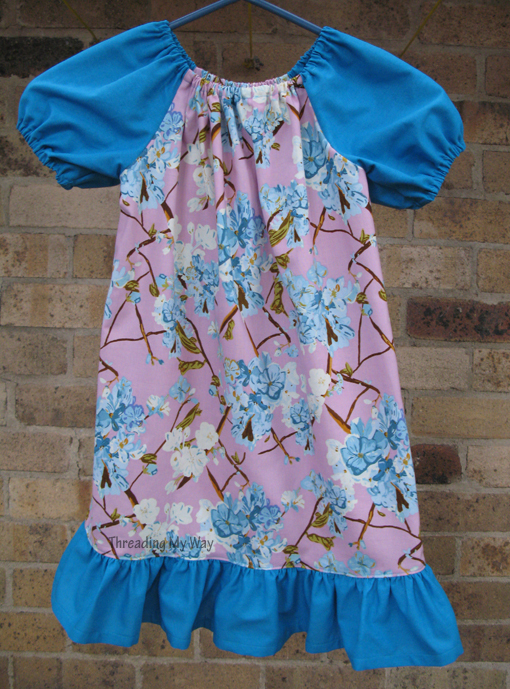 Sew Sister has made four beautiful pillowcase dresses with lots of girlie ruffles. Do you like Link Parties? When I first started blogging, I wondered what all the fuss was about. Even the name turned me off. I'm not a party kinda girl. However, I decided to give it a go. Now I party every week and I'm even OK with the name party! 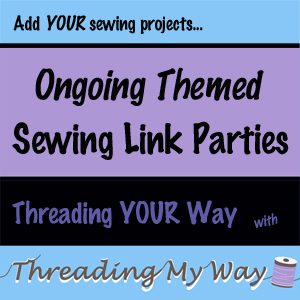 When I started my own Link Parties, Threading Your Way with Threading My Way, I wanted people to show off their stuff, to be able to look for interesting blogs and to find ideas and inspiration. But I wanted more. I didn't want them to be forgotten and to disappear after a week or two. I wanted them to be a resource of ideas on the one topic and for that reason, I made them ongoing. Because each one is on different topic, the number of people interested in each party differs and therefore the number of projects linked up will vary. It's been fascinating to see where the majority of interests lie... totes and girls' clothes being the most popular so far. As you can see, I'm not choosing themes based on popularity and this will mean that some parties will remain smaller. Perhaps we could call them exclusive... LOL!!! 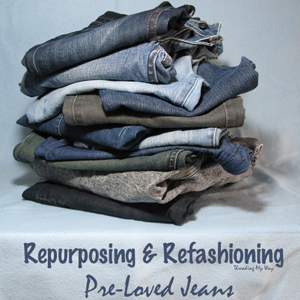 Even though I do a reasonable amount of refashioning, I won't be hosting an ongoing refashioning / upcycling link party, as there's already an awesome one in existence... Jill, from Creating My Way to Success, hosts Clothes Recycling Projects. The downside of ongoing themed link parties, is remembering to link up your current (or past) project to a party that was started a while ago. So, here's your reminder... have a look through the link lists and see if you have any projects (old or new), that you are proud of and would like to show off. I do look through all the parties each week, so rest assured, I will see your project if you link it up. Many of the parties have been pinned numerous times on Pinterest, so chances are, others will see it too. For those of you who are new to Threading My Way, a new party begins every Sunday, with features on a Saturday. Features come from any of the parties, not just the most recent. Master list of ongoing themed link parties. Rikka, from Ricochet and Away, is hosting the I Will Wear it in Public Garment Sewing Challenge. Here are the guidelines. The theme of this challenge is to sew any garment that YOU will be proud enough to wear in public. 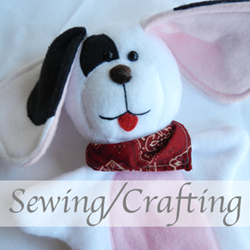 This is a sewing challenge so machine or hand sewing is a required element in your entry. You must make a new garment for this challenge. Upcycling and refashioning of existing garments is acceptable as long as you follow the second guideline. Don't confuse garments with accessories like hats, scarves, belts, etc. You must try something new when creating your garment. That's where the "challenge" part comes into play, right? Maybe you've never used a pattern, or sewn with knits, or installed a zipper. Here's your chance! Of course I'm joining in!!! A couple of weeks ago, I said that I would make three tops for myself before the end of the year. This challenge is just the motivation I need. 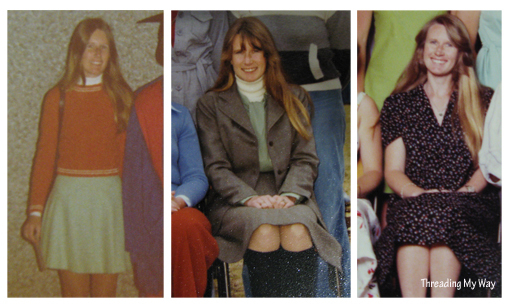 In my teens and twenties, I sewed a lot of my own clothes. There has, however been a big break of almost 30 years with no sewing for me, until last month when I made myself the Rose t-shirt. I made my first garment (a skirt sewn by hand) when I was eleven years of age. 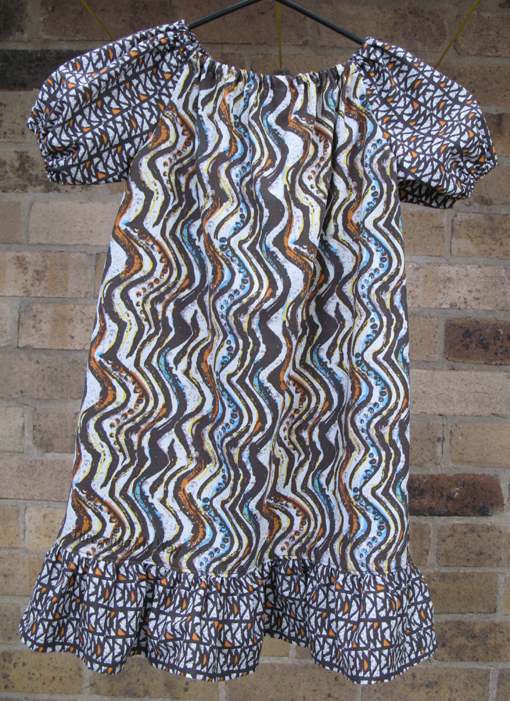 The next year I made my first garment with a sewing machine: a dress which was called a muumuu. During my years at school, I made a few garments, the most complicated being a fully lined woollen slack suit. Actually, I think my Mum helped me with this one. Even so, I was very proud of my pink slack suit. During my teens, I started sewing clothes for myself at home and continued to do so for many years. I've had a lovely time tonight, going through old photo albums, trying to find pictures of garments I've sewn. Unfortunately, there's not many. You'll see how the fashion has changed since then. 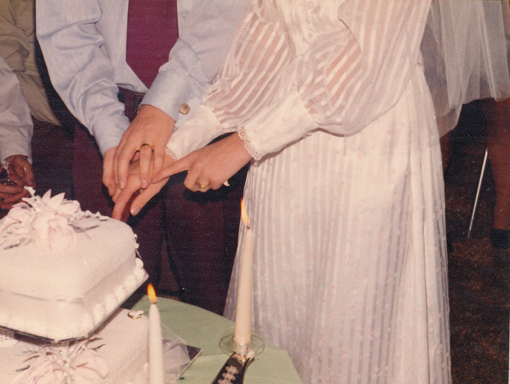 I've shown you this photo of my wedding dress before. The veil was much harder than the dress, probably because I didn't use a pattern. 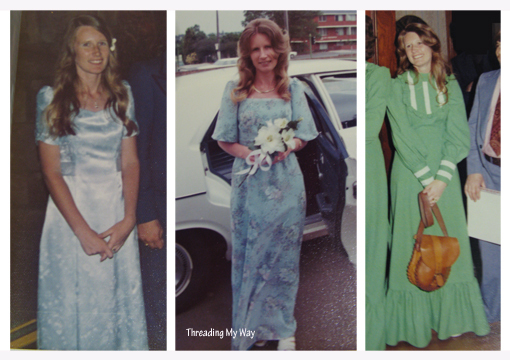 These are three bridesmaids outfits I sewed back in the 70s. The one on the left was made from satin, with a sweetheart neckline and little gathers on the sleeves. The middle one was the hardest to sew. It's made from a sheer fabric and is fully lined. 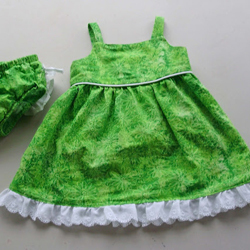 The green one is made from crêpe fabric. I still like the two blue ones, but I'm not so sure about the green one. I don't know that I even liked it at the time. The outfit on the left is what I wore to Mr TMW's graduation. I loved that woollen skirt! I knitted the jumper as well. Yes, it was the same colour as my kitchen... 70's orange. The middle photo shows another suit I made, this time without Mum's help. Again, the jacket is fully lined. The outfit on the right is a maternity dress. I couldn't find any photos, but I've done a lot of sewing with stretch fabrics as well: skirts, t-shirts, sweaters, trackpants. Back to the challenge... something that is new to me. I haven't sewn jeans or underwear, but I have no intention of sewing either. Jeans are the only item I am now fussy about. I tend to stick to the one brand that fits me well. And underwear... no way am I going to go there... LOL!!! I have never attempted smocking. Yes, I'd like to learn how. I have never made a button loop... the little loop you make when you don't want to do a buttonhole or when the material doesn't overlap. I have also never altered a pattern, other than to take it up or in. Now that would be quite a daunting challenge, as I do rely on patterns. I'm learning that it's good to think outside the square and am enjoying refashioning clothes without using a pattern. I don't know if I'm game enough to try altering a pattern when using new fabric. Keren, from Sew la Vie! Entries for the I Will Wear it in Public Garment Sewing Challenge, can be submitted anytime up until 31st May. Remember, as long as it's new to you, it can be submitted. The aim is to teach yourself something. So, if you have never sewn clothing, that means you can sew anything for the challenge. Would you like to join me in the challenge to teach yourself something new while sewing for yourself? Head on over to the challenge home page to find out more details. 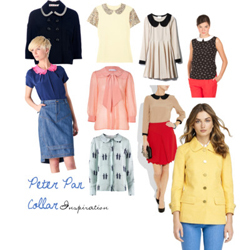 Or have a look at the Garment Sewing Inspiration board over on Pinterest. Welcome to the seventeenth edition of Threading YOUR Way with Threading My Way. Each ongoing, themed link party is steadily growing into a resource full of ideas and inspiration. 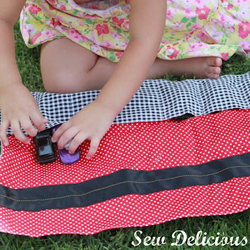 Our seventeenth linky for 2012 is everything Sewing With Stretch Fabric... clothes for adults or children, tips for sewing with stretch fabric, anything else sewn with stretch fabric. If you have previously linked up an item made with stretch fabric in another category, feel free to link it up again here. As long as YOU have made it, link it up and show it off. 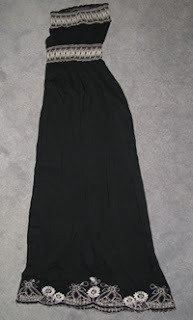 Link up as many posts on Sewing With Stretch Fabric, as you would like. Come back through the year and add more. Each post needs to be about a something that is sewn with stretch fabric. What is it that makes a dress look just right? You can have the most wonderful pattern, but if you don't have the right fabric, the dress won't look wonderful. In fact, if you have chosen the wrong fabric, the dress will look anything but wonderful. On the other hand, you can use a very ordinary pattern, but if you choose the right fabric, the dress can be stunning, awesome, wonderful and have the WOW factor. Of course, this is all subjective. We all have different tastes and I see that as a good thing. How important is the fabric? How important is the pattern or style of garment? 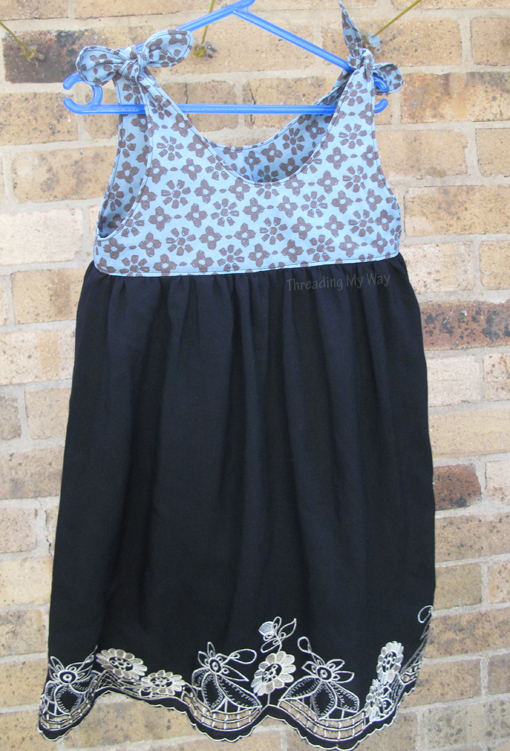 For this little dress, I've cut off a pre-loved (but as new) onesie and used fabric from my stash. I've cut the main fabric in one piece and so only needed one seam, which I've done as a French seam and sewn at the back. The ruffle makes it extra girlie. My Mum found this fabric in an Op (thrift) shop. It's a good quality cotton and brand new. It's the perfect match for the new blue t-shirt that was sitting in my cupboard. Thanks, Mum! I liked this one as is, without adding a ruffle or band at the bottom. The last dress is much larger than the other two; about a size 12. I originally made the band twice the width, but it just didn't look right. The band is made from a thinner cotton, than the cotton floral, so I was able to turn it up again. I was glad I didn't have to unpick the band!!! From the right side, it looks like I've done two rows of topstitching just above the band. I've added a row of hand stitching to finish it off. 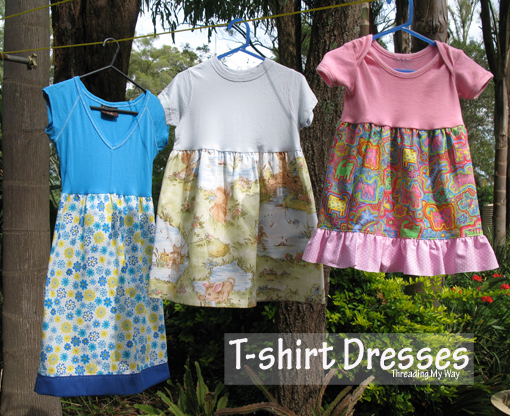 These three dresses will be heading off to the Australian representative for Dress A Girl Around the World. 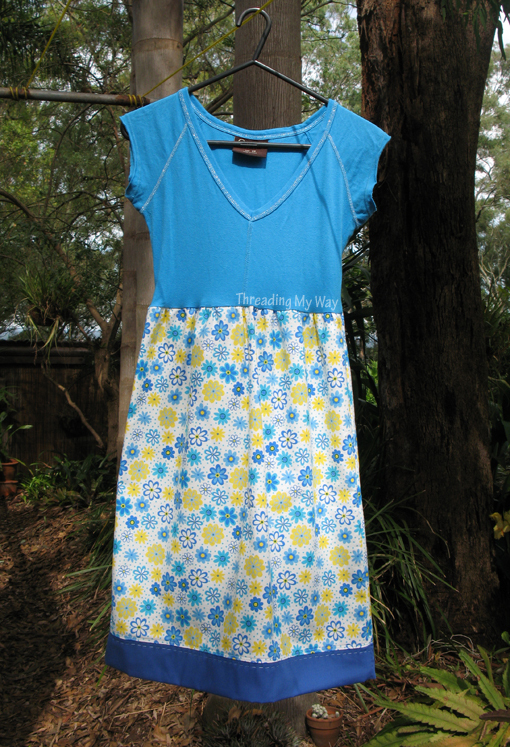 Head on over to Hopeful Threads for details of Kristy's sew-along to support Dress A Girl Around the World. Flickr group - to see dresses already made. You should have a look at the two adorable dresses that Cass, from Cass Can Sew, had made for this month's sew-along; a Flutter Sleeve dress and a Pillowcase dress. 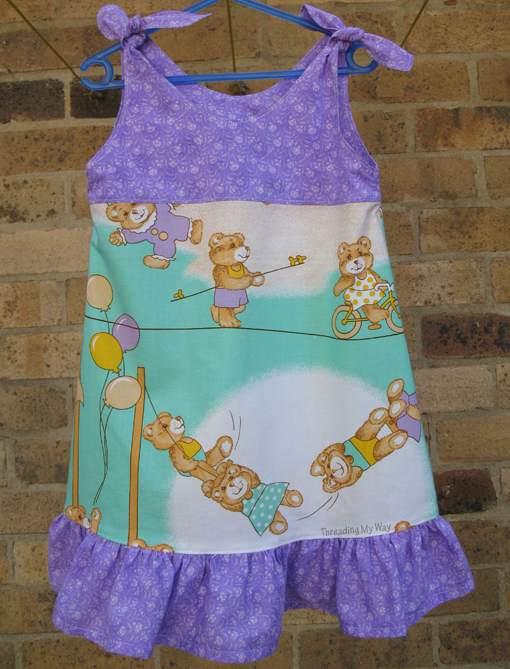 Then head over to A Home, Made, where you will see two gorgeous dresses sewn by Amy; a T-shirt dress and a Peasant dress. Kristy has a giveaway running at the moment: an autographed copy of Girl's World, by Jennifer Paganelli. I'd really rather you didn't enter the giveaway, because I'd like to win that book. So why am I telling you... because I'm so nice... LOL!!! I think this may be the shortest post I have done. 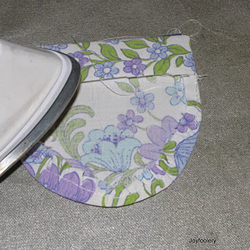 I'll show you how easy it is to sew French Seams. 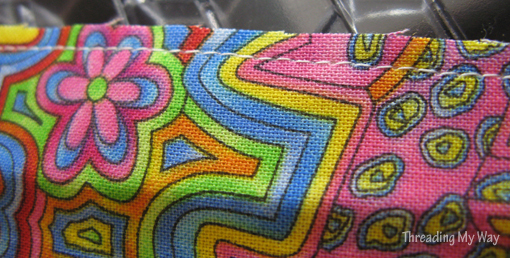 With wrong sides together, sew 1/8" from the edge of the fabric. Turn the material so that the right sides are together. That's all there is to it! Couldn't be easier. 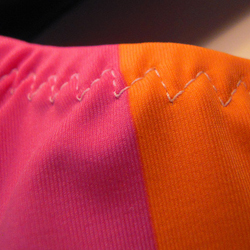 French seams make the inside of your garment as neat as the right side. I use them on bags that are not lined, such as my Treasure Bags and sometimes I use them on clothing, such as these dresses. To prevent hems from becoming bulky when using French Seams, don't lay the seam on top of itself when making the first turning for the hem. Face the two sides away from each other. I hope this makes sense without a photo (sorry, forgot to take one). If you'd like a photo, let me know. 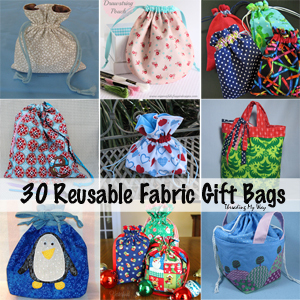 There are 153 fantastic bags and totes linked up to our ongoing Bags and Totes Link Party... so many great ideas!!! 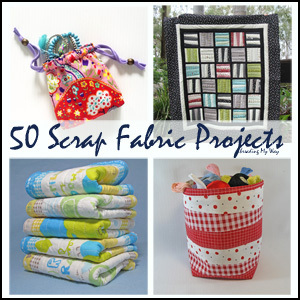 In this day and age, we are all conscious of reusing what we already have, so today I'm sharing some awesome upcycling tutorials from our bags and totes party. You will be amazed at the creativity!!! 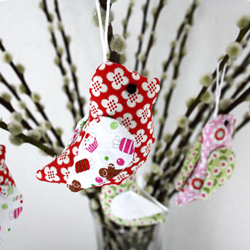 Each tutorial contains step by step detailed instructions, with lots of photos. Aren't they fabulous!!! Definitely thinking outside the square!!! 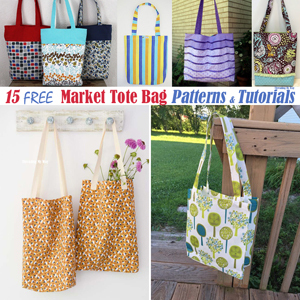 For more inspiration, head on over to our ongoing Bags and Totes Link Party. If you've made a bag or tote yourself, I'd love you to link it up.